A Level 1 Referee course will be delivered by Adam Stevenson at the Dalby PCYC on Saturday, 23/02/19, from 8:00pm to 12:00pm. To register for this course, please click here and complete all of the mandatory fields which includes reading and agreeing to the terms and conditions contained in the National Membership & Participant Declaration. Registrations close on Thursday 21/02/19. 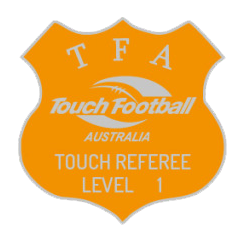 The cost of the Level 1 Referee course is $50, which is to be paid at time of registration. Prior to attending this course, participants MUST: Complete the Australian Sports Commission Introductory Level Officiating General Principles course. Email a copy of the ASC course certificate to SWQ Touch by Friday 21/02/2019.